NEW YORK (Reuters) - Elon Musk's lawyers said that the U.S. Securities and Exchange Commission failed to satisfy its heavy burden of showing that the Tesla Inc chief executive should be held in contempt, and the tweet prompting its contempt motion was both proper and "not material." In a Friday filing in Manhattan federal court, Musk's lawyers also said their client "respects his obligations" to the electric car company, its shareholders and the court. Musk's settlement, including $20 million civil fines for both him and Tesla, resolved an SEC lawsuit over an Aug. 7, 2018 Twitter post in which Musk said he had "funding secured" to take his Palo Alto, California-based company private at $420 a share. The SEC said Musk committed a "blatant" violation of that settlement by tweeting about Tesla's production outlook without first seeking approval from the company's lawyers. But in Friday's filing, Musk's lawyers said the SEC had conceded during settlement talks that Tesla-related tweets were not subject to a broad pre-approval requirement. They also said the tweet was not material because it simply restated old news, used generalities, was "aspirational and optimistic," and did not move Tesla's share price. "The key question is whether Musk complied with Tesla's policy, not whether the SEC is satisfied with Tesla's policy," Musk's lawyers wrote. "Musk's belief that the 7:15 tweet did not require pre-approval was correct." 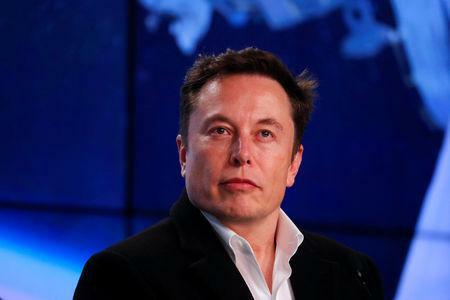 The October settlement required Musk to step down as Tesla's chairman. Legal experts said a contempt finding could subject him to a higher fine, further restrictions on his activities, or even removal from Tesla's board or as chief executive. Tesla shares closed Friday down $9.49, or 3.5 percent, at $264.53. They are 32 percent below their peak set on Aug. 7, after the "funding secured" tweet.